Ars Electronica 1990, VR-Symposium with Jaron Lanier, Warren Robinett, Brenda Laurel, Marvin Minsky, Timothy Leary ... from ars history on Vimeo. 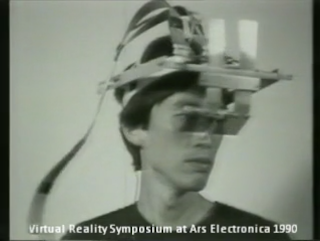 I had a low-end cheap home-rigged 3d VR headset in the early 90's. It ended up sitting on my monitor looking like a really strage set of Mickey Mouse ears for a few years.